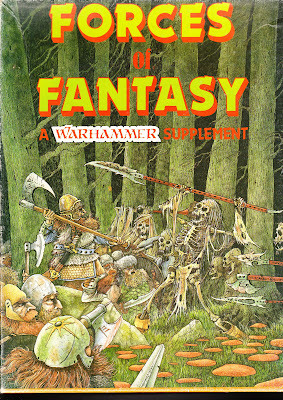 Forces of Fantasy was the first published supplement to the Warhammer rules system. Like the basic game it was a boxed set, and included 4 booklets: Forces of Fantasy, Fighting Fantasy Battles, Arcane Magicks and the Book of Battalions. It includes all of the new rules and errata introduced in the First Citadel Compendium (except for the Mark of Chaos article and Science Fiction/Modern rules). Forces of Fantasy looks a lot more professional than the game it expands. The layout is professional, arranged in neat columns with a good font rather than the type-writer blurbs in the basic rules. The art is still very nice and varied. Blanchitsu box-cover and the art inside by various artists, include Tony Ackland, Nick Bibby and of course, John Blanche. The eponymous booklet of the publication holds a large collection of army lists and includes the army selection rules and introduces a points system for organising your army into battalions of 1000 points. It is the most wargame-oriented booklet of the set, and also introduces rules for regimental leaders and champions, banners and musicians. The rules for capturing an enemy standard are very characterful and complicated, basically a dice-off between both units, the loser suffering casualties and the winner capturing the standard. Very cinematic. This booklet also gives the rules for the Leadership Factor characteristic. The point system is not fully detailed as in 2nd edition/rogue trader, but a list of equipment values is given just before the army lists. There are a lot of army lists, 4 types of humans (North, East, West and Oriental), 4 types of elves, Halflings, dwarves, gnomes, Orcs, several Goblin variant (Great Goblins, Red Goblins, Hobgoblins, Night Goblins), Chaos, Slann, lizardmen, undead, Giants and Monstrous Hosts. Each army has several troop-types on offer and details the character-models available to the armies. New special rules and abilities are also introduced as well as a 3d character type just for the Oriental Humans: the Martial Hero (basically a Wuxia Shaolin monk “class” with amazing stats). Once more, Chaotic attributes are mentioned but not detailed, and even the Chaos character models don't get rules in this book, the reader is once more referred to a 'forthcoming' supplement called "Realms of Chaos" to create his leader characters. The "Mark of Chaos" article from the First Citadel Compendium is presented as alternative, to use while awaiting the Realms of Chaos expansion, possibly in conjunction with the Character generation rules of FoF volume 2: Fighting Fantasy Battles. The character profiles for heroic leaders and wizards are introduced and have a rough level system. Some races/armies have access to all levels of wizards/hero, while other are limited to “Acolyte” level wizards and Heroes at best. Halflings are worst of, no wizards and only up to Hero level Characters. It is a very useful booklet as the arrangement of text and the characteristic profiles are very readable. In addition, every army-list also includes a random generation table to generate the kind of creature a party encounters in a random encounter. I.e if the GM generates a random encounter with some Orcs with the tables in Vol3. Characters, he may use Forces of Fantasy to see what kind of Orcs they are. Each army/race gets a bit of background, but it's very summary compared to later publications. As of yet, nothing of the warhammer setting is set in stone. Fighting Fantasy Battles is a mixed affair, introducing new rules for siege weapons, fire, buildings (and setting them on fire) and (finally!) Personal Characteristics along with painting and wargaming advice. We also get the long awaited rules for Fighting Defensively (which allows you to stop an enemy from attacking you), which is a very characterful rule and ideal for RPG combat. The rules for mounted troops also add detail for small engagements if so desired. There is also a chart to generate random hazards (animals, monsters and undead) inhabiting terrain features on the battlefield that units walk into, very much like Newhammer's terrain rules. Generally there is a 5-10% chance that any terrain feature holds some kind of creature. I think it can be useful for sandbox adventures, or when the Player characters seek out a resting place in the wilds. The rules on personal characteristics does not provide much rules for characteristic tests, only Willpower introduces a system for Magical Resistance, but all other characteristics are limited to providing guidelines on what psychological conditions affect a character. Leadership was detailed in the Forces... Booklet. Intelligence determines if a character is subject to Stupidity, is a fast or slow learner, if a character can be a wizard (INT 5+ required) and how fast one learns skills or gets promoted in a day job in one of the skill professions. Willpower introduces a system for magical resistance, and gives dwarves extra flavour by making dwarfs with WP 16 (?) so immune to magic that they cannot wield magic items, nor become wizards and cause fear to any wizard within 12”. Cool is very much the characteristic of self-control in this edition. Characters with a particularly low Cool are subject to Frenzy while those with a high cool may be immune to Frenzy, Fear and Terror. There is also a page detailing the random generation of mercenaries. It's interesting, but very much geared towards the wargame tier of Firsthammer rather than the RPG side of the system. Then comes a bunch of pages detailing the tactics, organisation and uniforms of the various races, followed by the Regiments of Renown, who give us new insights in the warhammer world. Many of the regiments or characters are still around to this day, including Josef Bugmann, Menghil Manhide, Grom -the paunch of misty mountain and Golgfag and his mercenary Ogres. 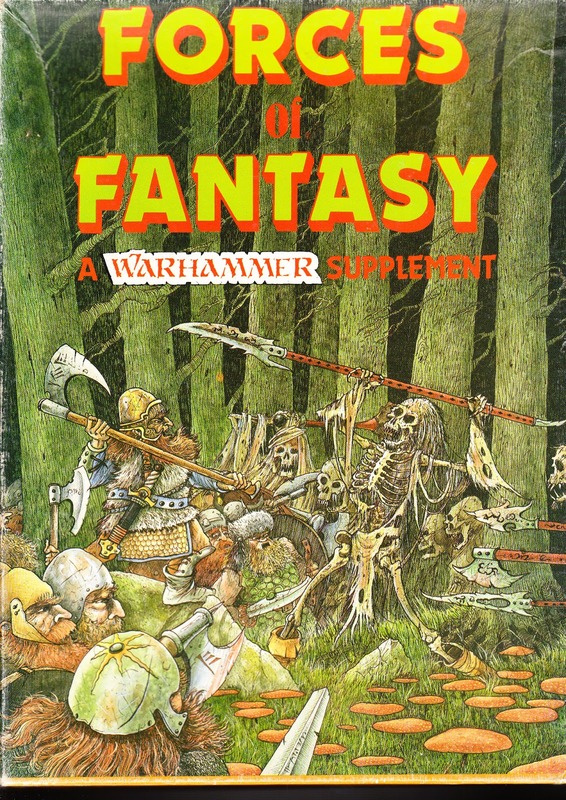 The chapter that interested me the most is the chapter on randomly generating Heroes and Wizards, in a manner that is quite possibly the inspiration for the Realms of Chaos warband rules! It has a bunch of tables to determine hero/wizard level, their characteristics, any possible magical equipment, fantastic mounts and the chance of and number of followers a character has and what kind of followers they might be (including animal/monster companions). It's not at all balanced and I can't imagine these rules to see much use in wargame battles with armies created using the battalion rules, but I can see it's value in as a character generator in an RPG or Skirmish campaign! When used as character generation rules for an RPG variant of Firsthammer, you'd get characters that are more durable and possibly have a few magic items and/or followers. I also like the remark that the quality of randomly generated heroes is “In the hands of Goethi and Spanaal the Gods of Chance”! There are rules for generating heroes for the three races available for player characters in the Role-play variant, Men, Elves and Dwarfs. It also gives a bit more differentiation between the 3 races, Dwarfs being slow but tough having the highest possible wound score among the three but lowest initiative levels, while elves are skilled, fast and fragile (least max. wounds) and humans are somewhere in between. The followers generation table for human characters is the most diverse and might also factor in a character's alignment, some results giving a human hero the choice between a Dwarf or Ogre or Elf or Orc as follower. It also strikes me that elves have the lowest possible amount of followers (d8 at best for a mighty hero/mage), while Dwarves have the highest (3d10 for a Mighty Hero/Mage) and humans are again in between (2d10 for a Mighty hero/mage). It seems unfair to have a quite powerful race have the most henchmen, but in contrast to humans and elves, Dwarfs get no 'creature' followers (which includes manticores and wyverns!) like humans and elves do, nor may they have Fantasic Mounts, so the possibilities of such may balance things out. Hey, let's make a hero! The third booklet is the most Role-play oriented of the lot. We get a bunch of new magic items, magic item random generation rules, a few new spells, new creatures and a more detailed and expanded treasure generation table, detailing the possible 'treasures' found in various kinds of buildings. Points values for magic items are not all to common throughout the book, but most rules include a monetary value in gold crowns, the currency used in the Role-play variant (WH1 vol.3). Once more magic is very much geared towards (role playing) campaign play, but has the potential to add a lot of flavour and excitement to the battle game. I like they way magic weapons are handled in this edition, weapons often having a certain alignment (chaos, evil, neutral, good, avarice or hunger), a willpower factor and possibly even a name! All these factors must be taken into account to see if a character can wield the magic item at full effect or suffers penalties using it, a slimmed-down version of this was used in WFRP ed. 1 where you must pass a WP-test to be able to use a magic item. Unlike the white box Vol.2: Magic, there is not a whole lot of setting-notes beside the introduction of Araby and its native magical creatures (Djinn and Efreet) and items (flying carpet, magic lamp, magic rope) and the chapter on Power weapons. Forces of Fantasy as a whole introduces the Slann as the ancient race of 'creator god-aliens' thet build the world and brought in magic, the artefacts of the Slann being presented as Arcane Rods and Power weapons. Arcane Rods are basically storage units for magical energy that can be used to cast, enhance or resist spells. Power Weapons are more dangerous items, which can enslave weak-willed characters and drain away their willpower up to a point that the character is compelled to undertake a long journey to some Slann ruin where some ritual takes place that results in mastery of the weapon. Power weapons are a bit like the later Deamon Weapons in that way (powerful but dangerous to wielder and victim alike), but also find employ as “laser-guns” and heavy hitters. These weapons should obviously be very rare and highly sought after by ambitious characters and/or villains and may inspire a campaign arc. Finding one by random chance in a sanbox environment might add a defined plot to such a campaign if the GM is willing. This booklet details some army lists. I'll not go into details on these, for I am more concerned with the RPG aspect of things. I'm looking forward to seeing you run a campaign with these rules - your blog has inspired me to dig out my 'firsthammer' stuff (argh! I'm missing one of the Forces of Fantasy booklets) and am thinking about seeing what I can get out of it. Thanks for the comment, nice to hear you're inspired by my posts. I highly recommend seeking out Forces of Fantasy in any form or shape (print or pdf), it's not essential for play, but it has a lot to offer, including some guidelines on what personal characteristics do. Can you help me? I have a hard time spotting the rules for Alcoholism in the 1st ed rules. Only in 2nd ed. can you point me to the page that explains the rules for both giants and Men of the north being drunk at the start of the battle?